With Mike Quinn being the brains and indeed brawn behind Viking baits it was obvious that it wouldn’t be long before we got some of these baits on test for the site. Now this is certainly not a new bait as Mike has been rolling his own bait for years. The bait has certainly accounted for some of the bigger and indeed tougher residents of Mikes local waters. Right onto the bait. 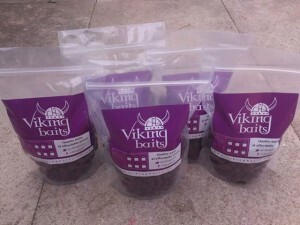 Viking has 3 baits currently available MONSTER CRAB & PLUM, TIGERNUT & HNV SUPERBIRD. All of these baits have a great record since going live as a consumer bait in the last few months. The bait on test for this review was the Tigernut. This is a quality base mix using perfectly balanced tigernut ingredients with nectar blend and betaine. The nuttiness and richness of this bait is not synthetic but from the raw natural ingredient in the flours and meals used. A perfect all season bait that we feel will certainly be a winner for the colder months. Stay tuned for some more news from Viking baits check out their page for more details. Viking Baits specialise in the development, design and manufacture of specialist fresh frozen bait that provides carp with the nutritional requirements to sustain and promote growth within a natural environment.